Ham & Cheddar Quiche – So YUM! After a couple of disappointing meals I decided yesterday I would make something pretty fail proof and redeem myself! I didn’t have too many options because the cupboard is getting bare right about now (time to go shopping – YUCK). 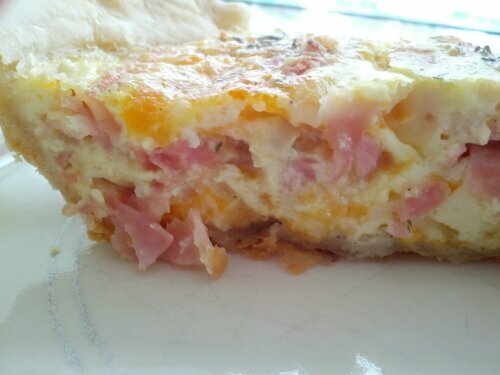 I did have everything to make a quiche except for a slab of ham I could cut up. We had prepackaged deli ham though, so I thought that might work… And it did! It came out great!!! I used this recipe for the quiche: Ham and Cheddar Quiche. I made the pie shell from scratch (just a basic crust – 1 1/2 c flour, teaspoon of salt, 1 stick of butter, a little cold water – maybe 1/4 cup or so). I had to alter the quiche recipe a little bit. 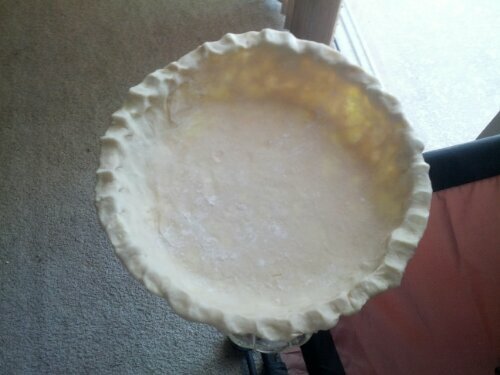 I don’t have a deep dish pie plate so I used my bigger pie plate thinking that would make up the difference. It more than made it up! I didn’t have enough filling! I quickly got another egg, a little milk, a tiny bit of all the seasonings the recipe called for and dumped it in with the original mix. It wasn’t quite enough to make it look perfect but it was close so I left it at that. Oh my, this quiche was so good and completely gone within 15 minutes! Fortunately I got a picture before the feeding frenzy! If you like quiche, this one is easy and delicious!